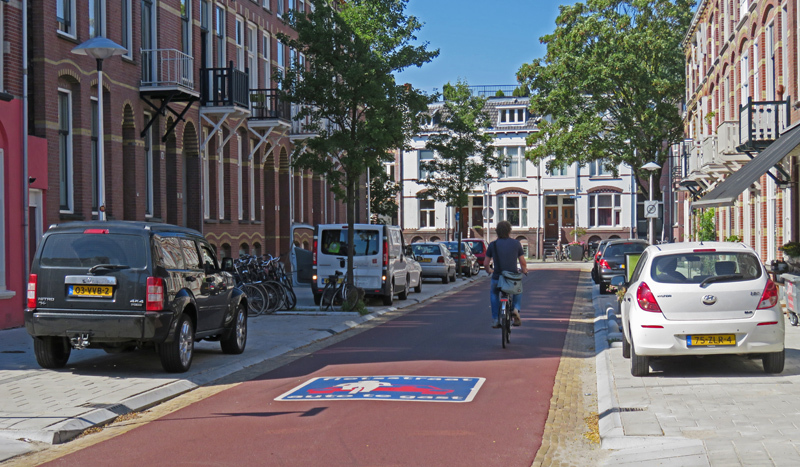 Utrecht’s tiny Koekoekstraat (Cuckoo Street) is one of many places that has been transformed recently to give cycling more space. Yet another example that the city of Utrecht is serious in making the city better for people and declaring the bicycle to be the city’s most important type of transport wasn’t some hollow phrase. 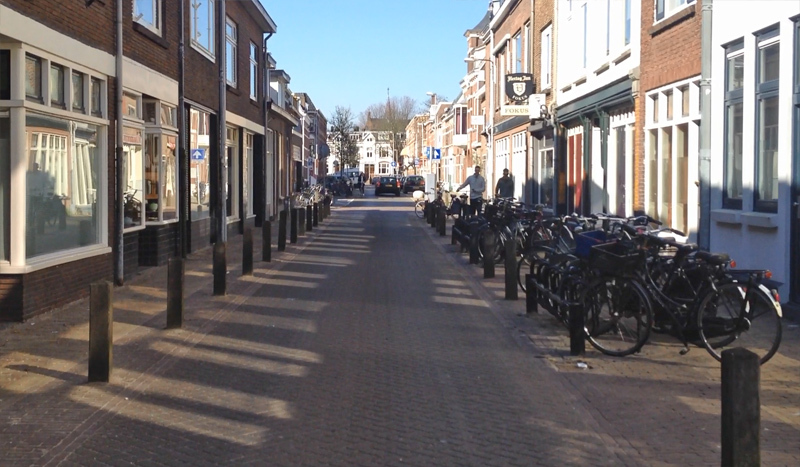 The entrance of the Koekoekstraat where it is only 7 metres wide. The big image on the surface was placed at the explicit request of the residents in the street. The former one-way system was changed for the benefit of cycling. You may now cycle in both directions. I’ve said it before: “Utrecht is changing rapidly” and indeed so fast that I can barely keep up. This reconstructed street was already opened last summer, but I had so many other things to tell you that I can only now show you what has been done here. This is one of the smaller streets of the city’s reconstruction project. I’ve shown you very big transformations, such as the returned city moat and the upgrading of the former city ring road at ʼt Goylaan, mid-sized projects such as Maliesingel, Adriaen van Ostadelaan and Mariaplaats, and the much smaller streets of Domstraat and Twijnstraat. 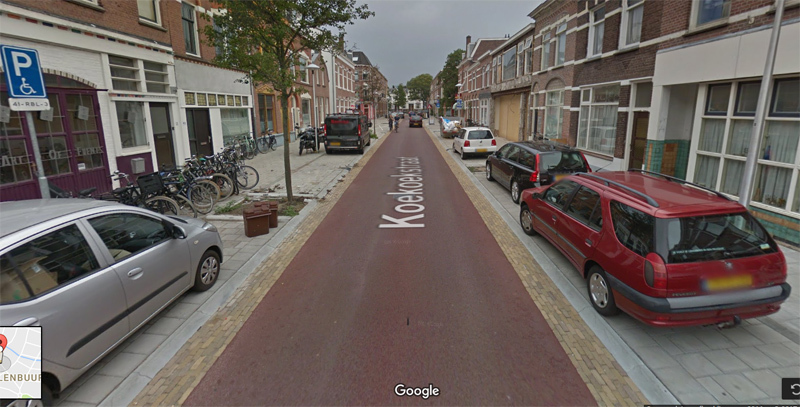 The Koekoekstraat, however, is a truly tiny street. At the beginning of the street the full width is only 7 metres (or just short of 23 Feet), while the second part of the street is exactly double that width: 14 metres. How are you going to make a street that narrow better for people without banning motor traffic? 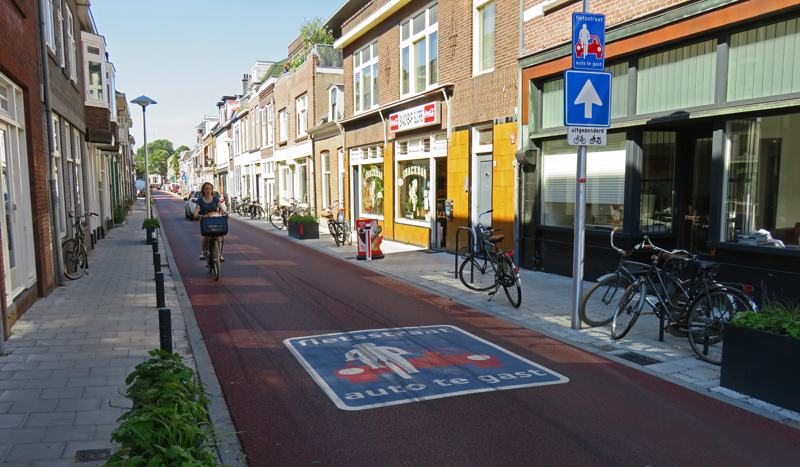 The only answer was to make it a cycle street and that is exactly what the city of Utrecht proposed to the residents. 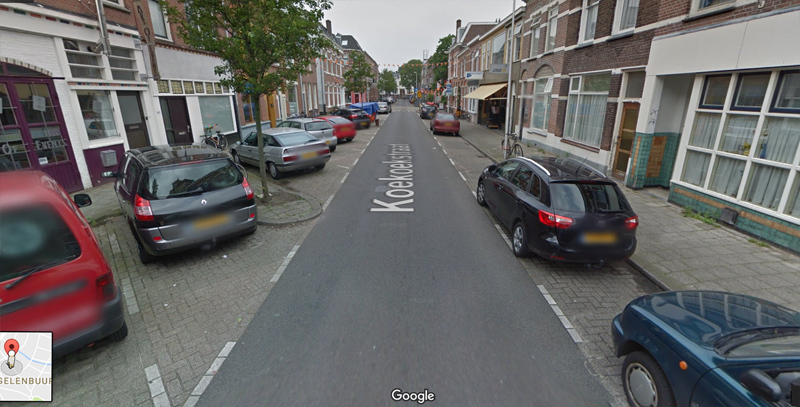 A Google StreetView image of the wider part of the street (14m). It felt more like a parking lot than a residential street. Parking sideways, like on the left hand side, is no longer possible. Google was very quick with an update. That means the new situation can already be seen. This is the same location as the previous picture. The street looks very different. Koekoekstraat used to be a through street with a lot of shops, but that was decades ago. Now it has become a residential street. You now mostly see living room curtains behind the former shop windows. The tiny street had a one-way system, also for cycling, and serves as one of the very few motor traffic exits out of the city centre. That meant the motor traffic volume could not really be reduced, but something had to be done. 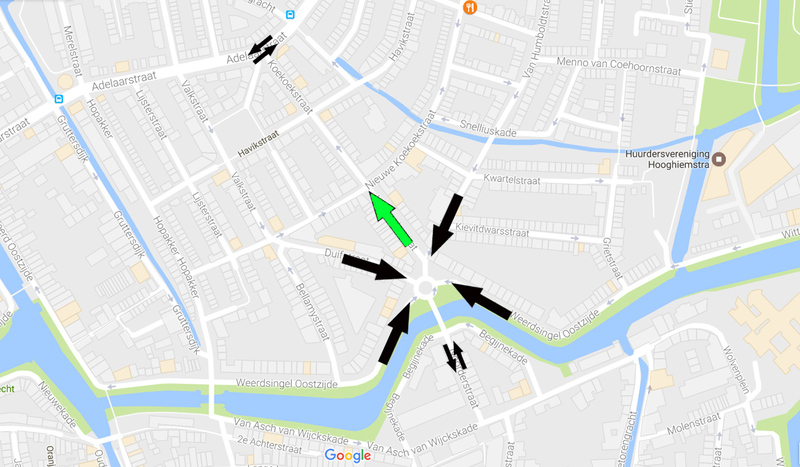 The Koekoekstraat (green arrow) is the only street that can be used to exit the area south of the water (the north part of the historic city centre, bordered by the old city moat). All the other streets have a one-way direction leading to the roundabout at the beginning of the Koekoekstraat. the street feels busy and unsafe. lighting will be improved if necessary. The narrow part of Koekoekstraat (7m) before the reconstruction. The parked bicycles took up a lot of space that should have been for walking. The street had pavers (brick). Koekoekstraat after the reconstruction. Bicycles are now parked parallel to the road, to have more space for walking. There are only a few planters. The reflective strips (red and white) were placed at the request of the residents. 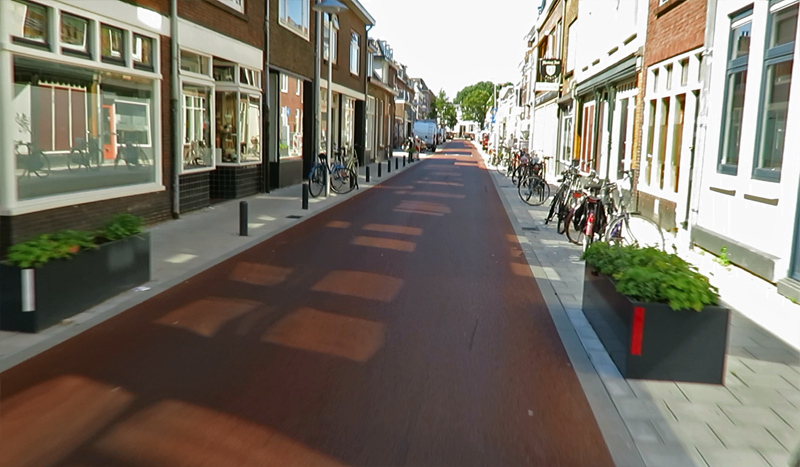 The surface is now a smooth red asphalt. In 2015, the city planned several community meetings, where residents and other stake holders got the opportunity to say something about the plans. But the decision that the street would become a cycle street was already taken. Expectations about the residents’ influence were further tempered by how the reconstruction was framed. The traffic management in the area (traffic flows) and the direction of the one-way street cannot be changed. Decreasing the (motor)traffic volume falls outside the scope of the project. The city could be pleased, however, that – by and large – the residents were in favour of making the street a cycle street. The city then proposed some smaller and larger details that the residents could decide about. This included the location of trees in the wider part of the street, planters in the narrower part and possible “images” on the surface. The wider part of the street (14m) has nice trees. Some of which were relocated, others were replanted later. The trees are also there to optically narrow the street, which in turn makes people drive slower. Cars park on sidewalk level. That means that when there are no cars parked, that space automatically doubles as extra space for walking. The minutes of the community meetings give an almost amusing insight into the evenings. A before and after comparison of the wider part of the street with the exact measurements in metres (read the comma as a decimal point). Picture: municipality of Utrecht. A before and after comparison in this week’s video. If it was up to me I would have had each street lamp look like a cuckoo clock. Or even a bird holding a lantern in the beak. There are now much less bicycle stands than before. And indeed the car speed / volume still is too high for a cycle street. Informative post, as always Mark! I’m interested by comments about ‘motor traffic’, particularly from residents about there being ‘too much’ of it. Clearly this is a relatively important road out of the city centre, with no alternative, but from your videos it doesn’t appear to be *that* busy – at least, from a British perspective. Do you have any idea what daily flows of motor vehicles actually amount to? Thanks. The motor traffic volume is now 3,000 vehicles per (working) day. That would mean there should be 6,000 cyclists to make it a 2:1 ratio and that is not the case. There aren’t that many people cycling here. So this is stretching the recommendations in the hope that the car volume will go down due to the design to make the ratio right in future. In the Dutch context 3,000 mv/d is considered busy. I should imagine the same as in the UK: cars are parked all over our footways (except perhaps in London). Surely expecting cars to be on the footway because so many of them are parking illegally is no different to expecting cars to be on part of the footway because the arrangement has been formalised. Cycling Dutch: It looked like cyclists shared the roundabout with traffic. Can we have a few more shots of that, please? Cars are not parked on the footway. There is a separate footway that always stays clear of parked cars as Jan also explained. But the designated car parking is on the same level as the footway and also with the same surface. That means that when no car is parked there, that space does not look like empty roadway, but rather like extra footway. The roundabout is shared yes, but you cannot see that in the video. (The video begins already outside the roundabout.) A shared space roundabout is unusual and should not be copied. Can only work here due to low speeds and relatively low traffic volumes. See streetview. How is a blind person expected to know where to walk if the car parking space doubles as pedestrians space when no cars happen to be parked? There’s a continuous ‘walking space’ close to the houses, and a ‘mixed area’ with either planters, bicycle parking or car parking. Doesn’t look that confusing to me, and is very common in the Netherlands. For a residential street, the layout here is quite predictable. In shopping streets, you’ll often find signs and other obstructions on the sidewalk, which are far more annoying to the visually impaired. This entry was posted on 14 February 2017 by Bicycle Dutch in Original posts and tagged before and after, cycle streets (Fietsstraat), Utrecht.